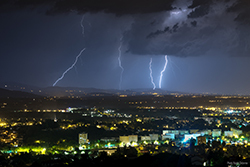 Lightning affects European territory on an average of 350 days per year, meaning that there is at least one lightning strike somewhere in Europe every day. August is Western Europe’s most lightning-prone month. 2018 was the most lightning-struck year in Western Europe in the last decade, with nearly 3 million cloud-to-ground flashes recorded across our European detection network and 353 days of storms. In terms of lightning density, the three countries where lightning has been most frequent in Western Europe over the last ten years are Italy, Switzerland and France. In Western Europe, three months in 2018 rank in the top five months with the most lightning in the last ten years: August, May and July 2018. 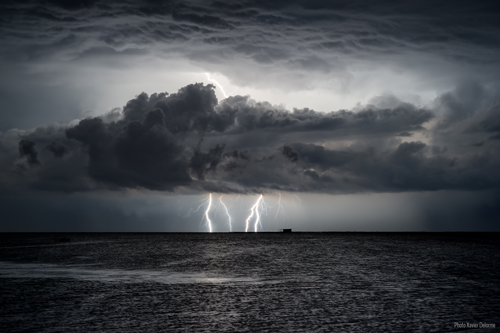 August saw more than 760,000 cloud-to-ground flashes in Western Europe – similar to this year’s record annual total in France. Two record days for the last decade were also recorded in Western Europe: 9 August, with nearly 84,000 cloud-to-ground flashes, and 27 May 2018, with more than 76,700 cloud-to-ground flashes. Twice a year, Météorage draws up an inventory of lightning activity in Europe (the annual summary and the first-half summary). *Western Europe currently covers the following countries: France, Spain, the United Kingdom, Portugal, Belgium, Luxembourg, the Netherlands, Ireland, Germany, Denmark, Switzerland, Italy.